Saddle bags will be listed soon. Contact us if you have something you are looking for. Please check in often because we will frequently update the product pages with new items. 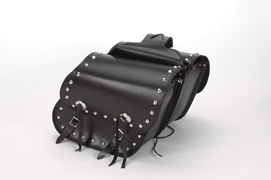 These are great saddlebags at a discount price. 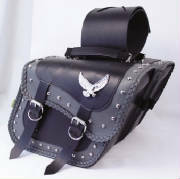 These very popular bags are also available in a package deal that includes the saddle bags, tool bag, and sissy bar bag. Click the above button for the "Package" Deal. 159.95 for all three "Grey Thunder" items. 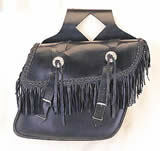 This is called the "Heritage" saddlebag. Nice mid-size bag for most bikes. Has storm flap underneath the main flap. Adjustable yolk. These bags are 13.5 inches long, 10.5 inches tall, and 6" wide. 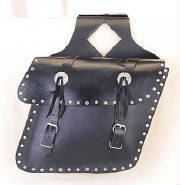 This is a nice medium sized slanted saddle bag. Bag size is 14" long, 11.5 inches tall, and 4.5 inches wide. Great bag for the price. This is a nice set of saddle bags wit conches. They measure 13.5" long, 10.5" tall, and 6" wide. Another nice set of bags for the money. Grey thunder Saddle Bags - our most popular bag. 17" Long, 6-1/2" wide and 11" high.